Some of the best characters aren't likable. For instance Sherlock Holmes, especially as brilliantly depicted by Benedict Cumberbatch. But that's okay. The trick is to get your readers to IDENTIFY with your protagonist. Making him or her likable is only one way to do that. I hope to convince you of this before I'm through but, first, let's take a step back and ask what the goal of writing/storytelling is. By the way, I'm taking this material from a course Michael Hauge taught with Chistopher Vogler (author of The Writer's Journey) called The Hero's 2 Journeys. Michael believes that the goal of every story is to elicit emotion from our readers. If we've done that then we've written a great story. 3. CONFLICT/ Something that's keeping our character from fulling their desire/obtaining their goal. An emotionally involving CHARACTER who strives to reach a GOAL (/fulfill a desire) against seemingly insurmountable OBSTACLES. What we're going to talk about now has to do with the first of these three pillars: creating an emotionally involving character. Here's what we want to have happen: We want our readers to empathize with our main character. We want our readers to identify with our protagonist's situation, his feelings and his motives. In general, people in love are sympathetic. When I see two people walking down the sidewalk with silly grins on their faces holding hands while sneaking furtive love-sick peeks at each other, I can't help but smile. This doesn't mean either character is likeable taken individually, but the fact that they have someone, that they are in love, helps (most readers) identify with them. Or you could make your character the victim of an undeserved misfortune. That would also evoke sympathy in most readers. Also, if a powerful antagonist deprived your character of something they loved--perhaps their spouse or child--this would be a good way to make your character sympathetic and introduce the Big Bad of your story. We like to hang out with people who make us laugh. Why is this? I don't know. Maybe it's because they can say funny things we don't have the courage to. Make your character a kind, good hearted, person. Show that they are liked by the other characters in your story. This is probably the most common way writers attempt to get their readers to identify with their main character(s) and it works! Example: Tom Hanks in practically every movie he's been in. We identify with people we worry about. Put your character in danger of losing something of vital importance to them. Example: Pulp Fiction. Butch Coolidge (played by Bruce Willis) and his father's watch. Example: Peter Brand (played by Jonah Hill) in Moneyball. Employ AT LEAST TWO of the above five elements when you introduce your main character. For instance in The Firm, when Mitch McDeere (played by Tom Cruise) is first introduced, we learn that he is getting top marks in university despite working as a waiter (sympathetic). We also find out that he and his wife are passionately in love (sympathetic & likable). What do you think? Do readers truly need to identify with the main character of a story in order to become emotionally involved? I'd like to thank John Ward for his post on how to make characters likable. 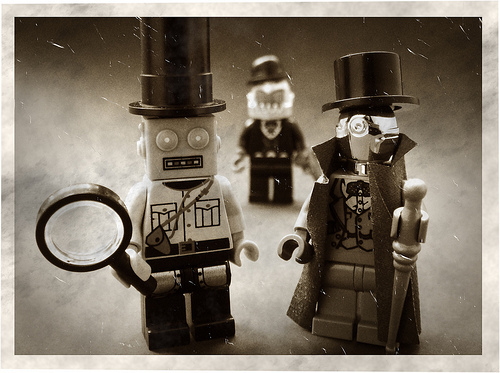 Photo credit: "Victorian Robo Detective and Dr WATTson" by V&A Steamworks under Creative Commons Attribution 2.0. Great read - Gonna put this into play on my NaNoWriMo story! Amazon Lists: The New Slush Pile? Serial Fiction: Is It Profitable? Does Amazon KDP Select Drive Away True Fans?